Blue and bluer come together in a peasant top with chest pocket and a casual neckline. 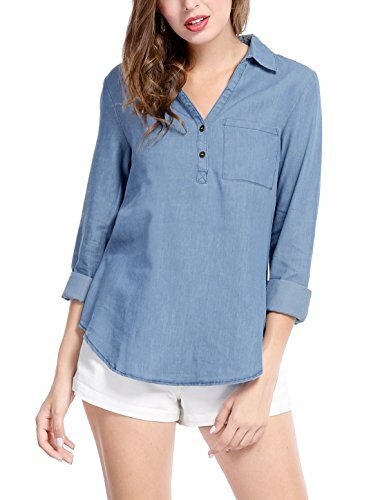 This undeniably pretty denim top has a classical turn down collar, full sleeves and half buttons closure. Embrace Western femininity in this light-wash nonstretch denim top styled, partial buttons and a stylish V-neck. 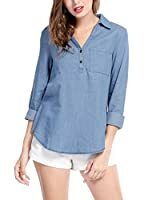 A high/low shirttail hem adds feminine detail to a button-front shirt in blue-wash denim with a borrowed-from-the- fit. A v-neck with a point collar and a shirttail hem lend sophisticated style to this casual shirt. The chest patch pocket adds traditional charm.